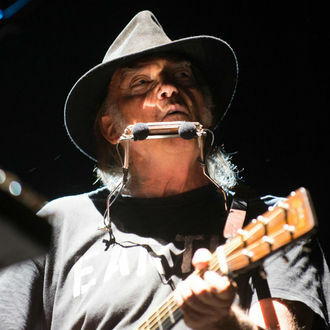 The rock-icon, Neil Young, is set to release his latest album on the 2nd December through Reprise Records. This will be Young's 38th album to date, and it will boast no less than 10 tracks. The tracks were all written since Young and his backing band's live album, EARTH, which was released last year. Young's latest album will be called, Peace Trail, and it features the work of two session musicians in Jim Keltner, and Paul Bushnell. Neil Young produced the album alongside John Hanlen, who also served as mixer, which all took place in Rick Rubin's infamous Shangri-La studios. The video to the single is full of random clips of the singer driving, police men arresting a suspect, and a top with the word "protect" on it. Peace Trail, is believed to be an acoustic album and one that is personal to both Young, and his listeners. The album will be available from all outlets and on all forms from the 2nd December. Kenny Chesney is set to receive the Pinnacle Award at the Country Music Association (CMA) Awards. Hitmaker Dr. Luke's lawyer has lashed out at Kesha's claims she starved herself due to pressure from the producer. Kesha was so miserable at the lowest point of her relationship with producer and former mentor Dr. Luke she attempted suicide. British singer FKA Twigs' new music video was inspired by her struggle to escape an emotionally abusive past relationship. ADELE has entered the US election debate by urging fans not to vote for Donald Trump at a gig attended by Hillary Clinton. Abba are planning to "reunite" formally for first time since their split over 30 years ago. Bruno Mars has labelled collaborator Adele a "diva with attitude". Pete Doherty has today announced two new live dates in the UK for both Manchester and London.